Moving through the Recession, Part 5: Are Exurbs Still Declining? Earlier this week, the National Association of Realtors announced that sales of previously occupied homes in the United States fell 0.6 percent last month. This drop came after a sharp decrease in December and a more modest one in January. Though the rate of decline in sales has slowed, this new data stoked fears that the brief recovery in housing is finished and another dip has begun. This announcement made us at TheCityFix wonder: How is the recession treating the urban and exurban housing markets these days? Back in 2007-2008, analysts were reporting that home prices in far-flung suburban areas were falling more than those in cities, close-in suburbs, and places with access to public transportation. (See news coverage in the New York Times, Boston Globe, Washington Post, and NPR.) The key drivers of this trend were thought to be falling incomes and rising gas prices. Sustainable development advocates were hopeful that these factors were finally lining the incentives up in the right direction – toward more compact, urban growth and against sprawl. Now that another year or two has passed and gas prices have dropped, this trend is not getting as much press. We couldn’t find an in-depth study on the topic – probably because more data needs to become available and more time needs to pass for patterns to settle out – so we took an initial stab at examining some of the data that does exist. Obviously, the housing market is complicated and an in-depth analysis is needed to uncover conclusive evidence, but we hope this first look will inspire thought and further study. The latest home sales data released by Metropolitan Regional Information Systems, Inc. (MRIS), the real estate information service for the mid-Atlantic region, suggests that outlying areas are bouncing back. In the D.C. area, for instance, some of the largest increases in median home sale prices between February 2009 and February 2010 occurred in exurban Virginia counties such as Warren (33.6%), Prince William (31.4%), King George (16.8%) and Loudon (15.7%). Close-in counties such as Montgomery in Maryland and Arlington in Virginia stayed steadier, with median sale price increases of 4.6% and 4.2% respectively. Upon closer inspection of longer-term trends, however, median sale prices in exurban counties may be growing more now because they fell further over the last couple of years. 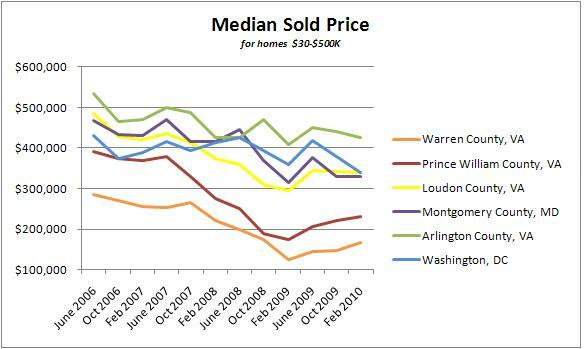 The chart above, which uses data from MRIS, shows the steep price drop experienced in select outlying counties since 2006 (notably Warren and Prince William), while prices in Washington, D.C. and Arlington County remained more level. A scan of home sales data provided by Zillow for the D.C. area shows a similar pattern. Median sale prices in the District proper have fluctuated seasonally, but have stayed fairly constant since 2005, until they began climbing again in 2009. Arlington County has followed a parallel trajectory. Montgomery County prices have been fairly stable as well, though they have not climbed as much recently. In contrast, sale prices in the larger D.C. metro area have been more or less declining since 2007 and have not started increasing again. Likewise, Frederick, Loudon, Prince William, Stafford and Fauquier Counties are still on a downward trend. In other words, the Zillow data suggests that core areas have hit some sort of bottom and rebounded, whereas outlying areas seem to be on their way down or, in some cases, just coming up. Of course each city is different, so let’s look at another example: San Francisco. Zillow shows that median sale prices in the city itself hit bottom in early 2009 and have come back up. The adjoining suburban counties of San Mateo and Marin follow similar paths. Prices in the outlying counties of Sonoma, Napa and Santa Cruz have been on a general downward trend but have stabilized somewhat since 2009. Suburban Contra Costa and farther-out Santa Clara counties are still going down. So what is going on here? As we said, it’s too early to know for sure, but we can make a few guesses. Trends may differ by metropolitan area. It appears that some urban communities are posting smaller gains than suburban or exurban areas right now, but again, this may be because outlying regions were hit harder by the crisis, so have more to gain with recovery. In contrast, some core markets have stayed fairly stable. This may confirm theories that consumers are no longer willing to pay the high financial and quality-of-life costs of long car commutes, and are gravitating towards more compact, convenient and transit-rich locations. For outer areas that seem to be rebounding, a couple additional things could be happening. First, we know that of the homes that are selling, 40% are distressed sales – often foreclosures or short sales often bought by investors (who may be renting the properties to tenants). We also know that the exurbs were hit hard by the foreclosure crisis. So, buyers may be snapping up the good deals offered by these foreclosures, driving up sales rates in outlying areas. Other factors may be in play, such as the first-time home buyer and repeat home buyer tax credits, whose deadlines are only a month away. Realtors are reporting more urgency from buyers seeking to close a deal in time. Again, many bargain hunters have flocked to the outer suburbs, where prices have been lower. Multiple offers are being placed on homes, driving up prices. This has also been helped by a loosening of lenders’ purse strings. Aging baby boomers – Some will be forced to stay in their suburban homes until values recover. Those who are able to move will not choose traditional retirement locations or senior housing, opting for mixed-age living environments that cater to active lifestyles. Younger baby boomers – This group will also face a tough time selling suburban homes, hampering the ability of these boomers to move. However, like their older counterparts, they will be drawn to more connected, compactly designed communities when they are able to switch houses. Generation Y – This tech-savvy generation has a population of about 86 million, more than the baby boomers. Gen Yers place high value on community; on places (either virtual or actual) to gather and share information, ideas and opinions. As they enter the housing market, they will be far less interested in homeownership than their parents were when they were young adults. Gen Y will gravitate toward walkable, close-in communities, choosing isolated housing on outer edges only as a last resort because it is the most affordable. Immigrants – The tendency of immigrants to cluster, and to live in multi-generational households, suggests that they would prefer larger homes if they could afford them and if the homes were in neighborhoods with a strong sense of community. The growth of two-person households and single households without children – among both baby boomers and Generation Y. Public policies encouraging compact development. Research by CEOs for Cities also forecasts the growing appeal of compact, transit-oriented areas, finding that people are willing to pay more for homes in walkable neighborhoods. Also calling the exurban resurgence into question, Kotkin and the ULI agree that the recession may have slowed migration. It is harder for people to move who are trapped in suburban homes that have lost value. As a result, we may not have felt the full effects of the housing crisis and rising transportation costs yet. If the exurbs appear to be bouncing back, this may well be a temporary phase. Moreover, one of Kotkin’s central premises is that urban housing, notably condos, has been losing value as much as or more than suburban housing. He blames this problem on timing, observing that urban condominium developers continued to build as the economy soured because of the longer lead times and financing arrangements around their projects, and arguing that as housing prices dropped many potential condominium dwellers opted to purchase single-family homes. However, since his article was written one year ago, this situation may have changed. Real estate experts are noting a developing condo shortage in certain areas, such as D.C. During the slowdown, developers were offering deals to eliminate a glut of multifamily units, including waived condo fees, free garage parking, and design upgrades. Now condo sales are heating up, and the inventory of new condos has fallen (by about 40% last year) while the construction pipeline shrank by half. As a result, some areas of Washington, Arlington and Alexandria are showing a shortage of condo units, which is predicted to bring more price increases by the end of this year. Another trend pointing away from suburban and exurban resurgence is the weak and uneven economic recovery of cities and towns. Declining tax revenues and municipal budgets will continue to hamper investments in new infrastructure. Publicly-funded projects like schools and parks are being delayed as budgets get cut and exurban population growth has slowed. Other amenities exurban dwellers want to see following housing development in recently built-up areas, like shopping centers and restaurants, have not appeared. Experts warn of a coming commercial real estate crisis that could exacerbate this problem. These issues could further add to the attractiveness of neighborhoods with established destinations and infrastructure. If Kotkin and other suburban advocates are right, their vision of young home buyers purchasing cheap new houses in far-flung areas is worrisome (especially when combined with ULI’s prediction of the suburbs’ declining desirability). Experts foresee continued increases in oil prices, which means driving won’t be getting any cheaper. Young families on a budget trapping themselves in remote locations with high commute costs and no transportation alternatives could be taking on considerable financial burdens. And like the foreclosed-upon exurban homeowners that preceded them, this burden might come as a surprise, as much of it is in the form of hidden transportation costs. Kotkin’s “suburban resurgence” ignores the full costs of housing, which include transportation. Planners and real estate experts must promote the new standard for gauging housing affordability – the Housing + Transportation Index – so these new homeowners don’t find themselves in over their heads when energy prices rise. It will be interesting to see how this settles out. In the mean time, policymakers and advocates can help their communities by educating home buyers and realtors about the financial and environmental impacts of housing choices, taking advantage of the economic downturn to plan for coming demographic trends, and targeting investments towards sustainable projects. Tags: Baltimore, business, housing, Moving through the Recession, North America, Quality of Life, Recess, recession, San Francisco, smart growth, sprawl, Suburbs, United States, Washington, D.C.